When a component’s Visibility changes based on a state change, you may also specify an Animation effect to use when it shows or hides itself. 1. 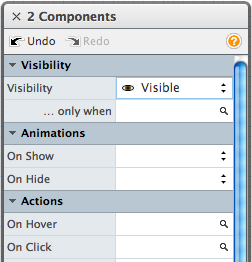 Select one or more components and open the component inspector. Choose an effect from the On Show or On Hide pop-menus. You may set only one, or both. The default setting is automatic, which means that it will do the opposite of any chosen effect. For example, if you choose to slide down when the component is shown, it will automatically slide up when the component is hidden.